2017 heralds a new solo album, FARAWAY PEOPLE (to be released in the Spring), a fresh collection of songs from master storyteller Reg Meuross which comment bravely on life as he sees it, bringing wide ranging stories, from the ravages of austerity and the injustice of the plight of refugees, to some of most beautifully disarming love songs ever written. Reg has that rare gift of being able to touch people through his songs and performance, on a really human level. 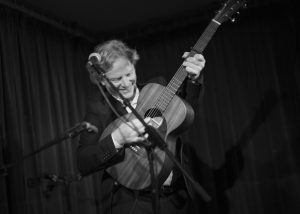 Described by Radio 2 Folk Show’s Mark Radcliffe as a ‘sensitive and socially aware songwriter, much admired on the scene’, Reg Meuross’ words and music paint pictures that remain with the listener long after the song has been sung. Reg Meuross is a true modern troubadour, representing contemporary English folk writing at its best. “There’s something special about the way he writes and delivers a song” Townes Van Zandt. His appearances at folk clubs and festivals throughout the UK and abroad, and his highly acclaimed solo albums have now established his songs as ‘the hinges upon which swing the doors of perceptive English folk’ (Folkwords).